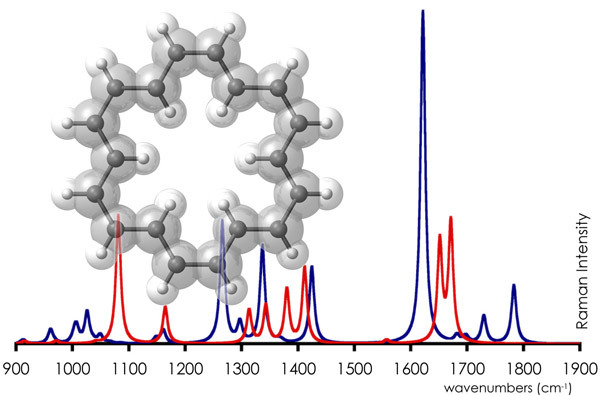 In press (DOI:10.1016/j.molstruc.2012.07.051) in the Journal Of Molecular Structure. May go down in history as a hardest-fought paper acceptance. In a similar line of research as the -annulene study, but exploring the infinite limit of geometry and bond length alternation energy barrier for this infinite case. 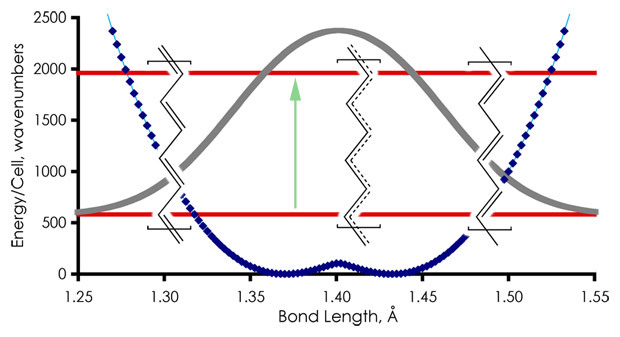 If the numbers are correct, the infinite polyene chains (polyacetylene) do not exhibit bond length alternation because the Peierls’ barrier between the single-double and double-single bond alternate minima is below the vibrational zero-point level. Plenty of ramifications. Abstract. The potential energy of the infinite periodic chain model of polyacetylene (pPA) is symmetric with two equivalent minima separated by the Peierls’ stabilization barrier. In this work it is shown how an energy scale and vibrational energy levels for this highly anharmonic Peierls’ degree of freedom can be estimated. Attention is given to the potential energy increase for large deformations. The Born-Karman treatment of translational symmetry is applied. Two empirical methods and a direct periodic boundary condition (PBC) density functional theory (DFT) calculations are in semi-quantitative agreement, each leading to the conclusion that pPA has a zero-point level that is above the Peierls’ barrier. The argument does not depend critically on the barrier height or the other parameters of the model or the computation method. It is concluded that pPA will not exhibit bond alternation and that the zero-point average geometry does not preclude possible conductivity.